Can Singapore Smooth China-ASEAN Relations? From China, Singapore’s foreign minister offers to pave the way for productive China-ASEAN relations. Singapore’s minister for foreign affairs, Vivian Balakrishnan, spent two days in China this week, meeting with Chinese officials to set a positive tone for both the bilateral relationship and the China-ASEAN relationship. It was Balakrishnan’s first visit to China since assuming his post in October 2015. In an op-ed for China Daily, Balakrishnan cited Lee Kuan Yew, Singapore’s first prime minster, on the importance of China’s relationship with Southeast Asia. “Lee Kuan Yew always believed that a strong China that was positively engaged with Southeast Asia would strongly benefit the region,” Balakrishnan wrote. To that end, he argued, “Singapore-China relations have been a pathfinder for China’s engagement of the region.” With Singapore currently holding the position of coordinator for the ASEAN-China dialogue, the city-state’s talk of setting the tone for China-ASEAN relations is more than just symbolism. As Diplomat readers are well aware, the major issue for China-ASEAN relations at the moment is the territorial disputes in the South China Sea. The islands and features are claimed in part or in whole by China and Taiwan as well as four ASEAN members: Brunei, Malaysia, the Philippines, and Vietnam. The issue has divided ASEAN, as claimants and non-claimants disagree on how much emphasis the grouping should put on the disputes in its approach to China. To achieve that goal, Balakrishnan said that, while in China, he planned to “focus very much on” the creation of a Code of Conduct in the South China Sea, which would lay out binding rules for the behavior of claimant and non-claimant states alike. Though China has committed to the negotiations, it has been accused of stalling the talks. Aside from the Code of Conduct, Balakrishnan told reporters that he and Chinese Foreign Minister Wang Yi had discussed ideas to control the risks of unplanned encounters at sea. Currently, the Code for Unplanned Encounters at Sea (CUES), signed by — among others — China and most of the ASEAN states (aside from Myanmar and Laos) in April 2014, provides “rules of the road” for unplanned encounters between navies. However, considering that many interactions in the disputed area involve coast guards or even civilians, U.S. officials have argued that there’s a need to expand the agreement. Balakrishnan, of course, also discussed China-Singapore bilateral relations, mainly focusing on moving forward with plans announced during Xi Jinping’s visit to the city-state in November 2015. 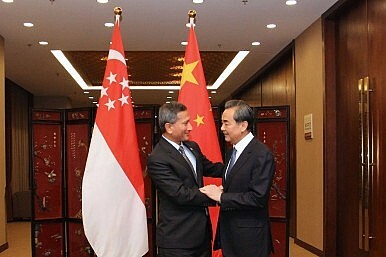 That includes expanding the China-Singapore free trade agreement, and cooperating on a newly announced joint government project, the “China-Singapore (Chongqing) Demonstration Initiative on Strategic Connectivity.” However, much of the discussion focused more on the multilateral dynamic – Singapore’s role in playing peacemaker between China and ASEAN. Balakrishnan wasn’t alone in seeing a special role for Singapore in promoting China-ASEAN relations. Chinese State Councilor Yang Jiechi, who met with Balakrishnan on Tuesday, said that China was “ready to work with Singapore to push forward the relations between China and ASEAN,” according to Xinhua. Likewise, Foreign Minister Wang told Balakrishnan that “China expects Singapore to fully play its role as a coordinator in the China-ASEAN relations,” according to a statement from the Chinese Foreign Ministry. Both Wang and Balakrishnan emphasized the potential for positive developments in China-ASEAN relations. Wang said that, though China-ASEAN relations “have kept a sound development momentum,” there is still “greater potential” for the relationship. And Balakrishnan underscored that China and ASEAN have more areas of cooperation than differences. However, before leaving for Beijing, he offered a less optimistic assessment, telling reporters that Singapore has its “work cut out” for it in smoothing China-ASEAN relations. China continues to hope its economic offerings can mend its relationships in Southeast Asia.